Perhaps you’re starting to notice I have a thing for polka dots. What can I say, they’re just fun! 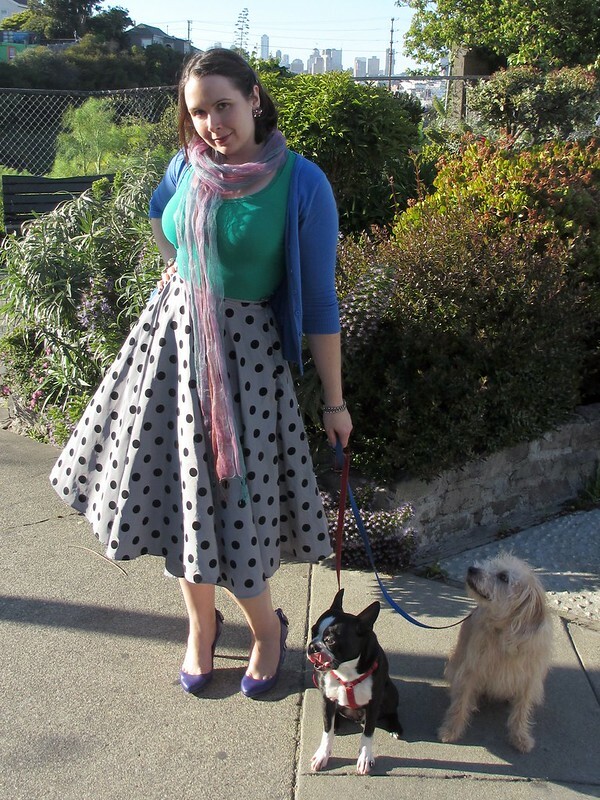 I recently bought this silver grey polka dot Bettie Page skirt from ModCloth. It’s the same cut as the B. Jones Style Skirt (styled here), though made from a light-weight, taffeta-y fabric. I paired it with a jade green tee, sapphire blue cardigan, and amethyst heels – with a sheer scarf to pull it all together. 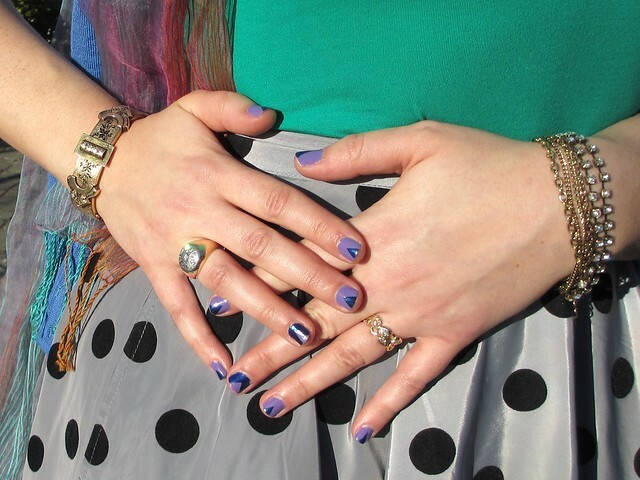 Manicure (with Julep nail polish), bracelets, and rings. Photo by Pat Zimmerman. As you can see in the photos above and below, I decided to add contrast to the silver grey of the skirt with some gold jewelry. 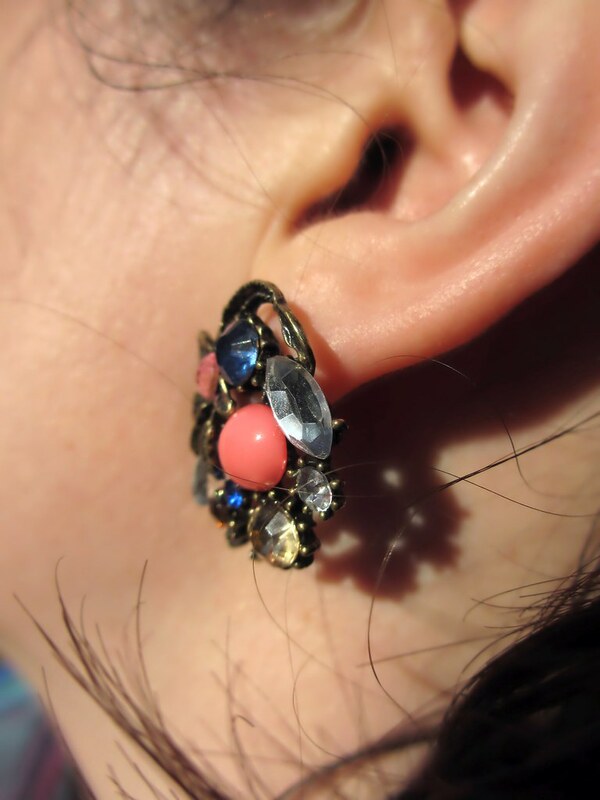 Heirloom-inous Earrings from ModCloth. Photo by Pat Zimmerman. Oh, and Jasper made his debut in an outfit post! (Though if you’ve been following me on Instagram – @katealamode – you’ve probably seen him several times already.) He’s an apricot blond poogle (a poodle/beagle mix) and such a sweetie! I don’t take him to work because he gets separation anxiety, so during the day he stays with my husband, who works from home. Jasper and Rocky showing their moves. Photo by Pat Zimmerman. A perfectly poised trio. Photo by Pat Zimmerman. Manicure: Marisa (dark blue) and Anne (violet), both by Julep. Inspired by this pin. Poogles are one of those “designer breeds”. Jasper was bred by a backyard breeder who was trying to capitalize on the trend – but he ended up at the pound & then a rescue (where I got him) when the breeder wasn’t able to sell him before the holidays! 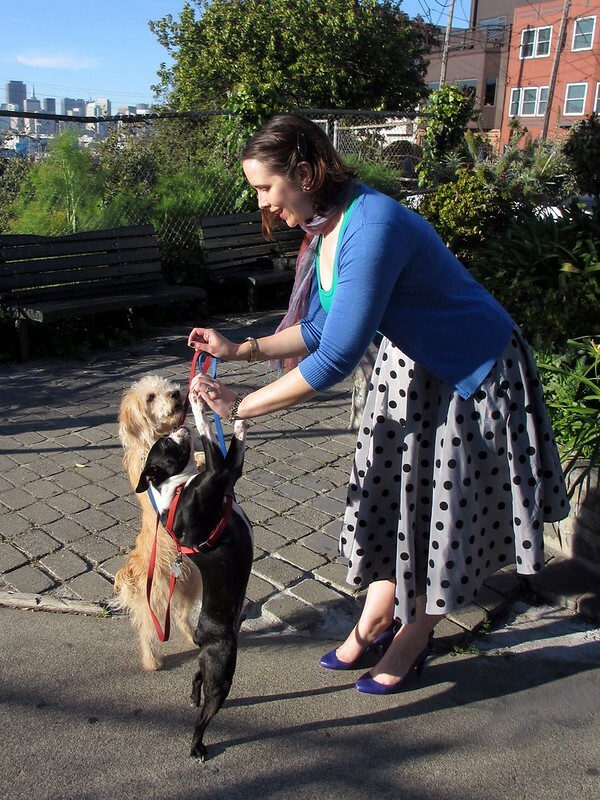 “…getting 2 dogs to pose for photos is rather difficult!”…sheesh! I bet! I’ll raise my hand about the polka dots too! Although lately, if people saw how many stripes I have in my wardrobe, they’d think I’m crazy! I also love stripes! Especially when they verge on becoming chevrons, due to how the fabric is sewn. 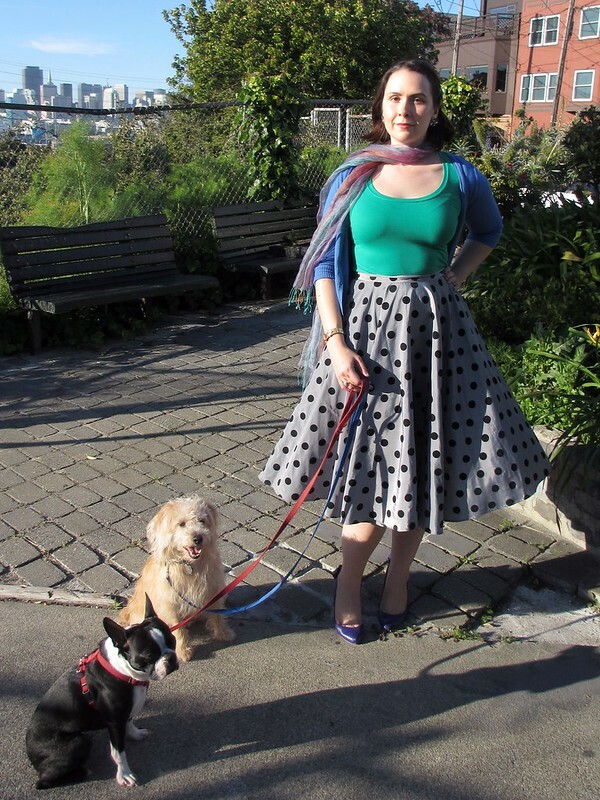 I love that last picture of you, the scarf perfectly blowing in the wind with the awesome full polka dot skirt….this style really suits you! You all look adorable!!! :) Such cute doggies youve got!